Win free tickets to the Ideal Home Show at Christmas 2016! Back in Manchester and London this year, the Ideal Home Show at Christmas 2016 brings you everything you need to prepare your home for the festive season. Win a pair of free tickets with our competition! 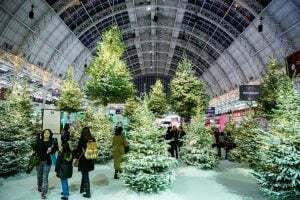 Back for 2016 at EventCity Manchester and Olympia London, the Ideal Home Show at Christmas 2016 brings you everything you need to prepare your home for the festive season. From the 10th – 13th November (Manchester) and 23rd – 27th November (London), this annual Christmas shopping event will give you ideas on everything; from decorations and hand crafted gifts, Christmas puddings and festive fizz, to furniture and New Year Home Improvements. Whether you’re after a family day out, an inspiring shopping trip or simply the time to pamper yourself, this year’s seasonal show is bound to leave you feeling festive! As a pre-Christmas gift, we’re offering you the chance to win a free pair of tickets to one of the shows, so you can treat a loved one to a great day out and get some fantastic home inspiration! Sorry – this competition has now ended. We’re now offering a unique discount code to get cheaper tickets – click here to find out more!